The government must clarify the UK’s future relationship with Switzerland and up to 70 non-EU countries after Brexit, a Commons committee has said. Last month, International Trade Secretary Liam Fox announced a deal to allow British and Swiss businesses to continue trading freely after Brexit. But SNP MP Angus MacNeil said the “most basic questions” about the relationship remained unanswered. The deal matches current arrangements “as far as possible”, ministers say. The UK is due to leave the EU on 29 March. A crunch vote in the Commons on the prime minister’s withdrawal deal takes place on Tuesday. Last month, the government announced that it had approved the transition of a trade agreement with the Swiss Federal Council that will come into effect in January 2021 or on 29 March this year if the UK leaves the EU with no deal. Switzerland is not a member of the EU but is part of the bloc’s single market. 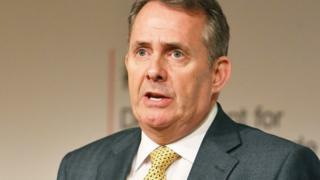 In a letter to Dr Fox, Mr MacNeil, the chairman of the Commons International Trade Select Committee, called for clarity on which aspects of the current relationship with Switzerland are replicated and whether it would enable UK-based firms to continue trading into the country on the “same basis as they do currently”. Mr MacNeil said: “Switzerland’s access to the single market requires it to accept both freedom of movement and a significant proportion of EU law. “It is based not only on a trade agreement eliminating tariffs, but also on a myriad of other trade-related agreements. “The secretary of state must clarify which aspects of this arrangement are replicated in this agreement with Switzerland. “Has free movement been accepted as part of the agreement to roll-over? Does the agreement allow UK-based firms to continue trading into Switzerland on the same basis as they do today? “And what about all the other 39 or so existing EU trade agreements? A Department for International Trade spokeswoman said: “The UK government and the Swiss Federal Council have approved the transition of a trade agreement that replicates the existing EU-Switzerland arrangements as far as possible.